In this family there is one thing which really gets everyone rushing around, and that is dolphins. In the Mar Menor we didn’t see any dolphins – they don’t come into that lagoon – but Mummy and Daddy were always full of stories about heavisides dolphins here, and pilot whales there. 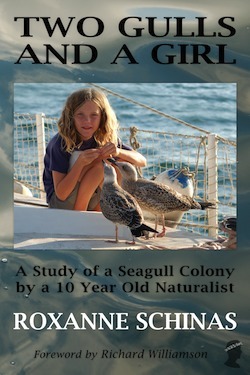 It seems that even sightings made before I was born, twelve years ago, are still remembered in detail! There was the story about the first time Xoë and Caesar ever saw dolphins, and of how Caesar (who was only two) wanted to eat them. There was the story about the dolphins which swam along slowly under our dinghy making it difficult to row for fear of hitting them with the oars. And there were descriptions of dolphins squeaking, and dolphins flashing past in the night, outlined in green phosphorescence. It seems that I had seen dolphins scores of times, but we spent so long on that big puddle in Spain that I didn’t really remember them. When we set off through the Mediterranean my first dolphin sightings were rather unsatisfactory. 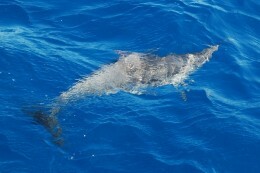 Just glimpses of fins, or fleeting visits where the dolphin left us again before I arrived on deck. True, we did have them swimming along beside us on a couple of occasions – but always in the dark. I could hear them, but I couldn’t see them. My first real sighting that I can remember came as a Christmas present. We were sailing down to the Canaries and a huge school of dolphins arrived. 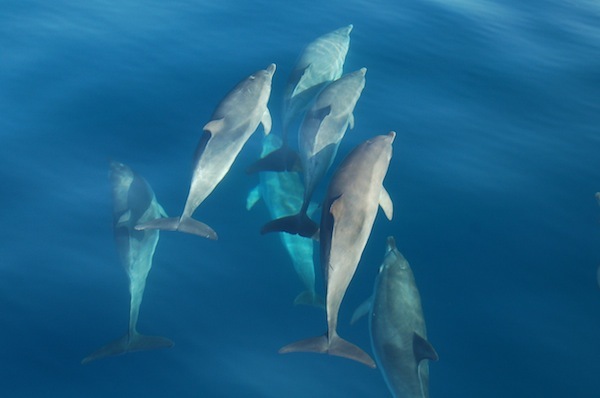 There were groups of dolphins on either side of the boat for as far as we could see, and since we were in the middle they came to our bow. 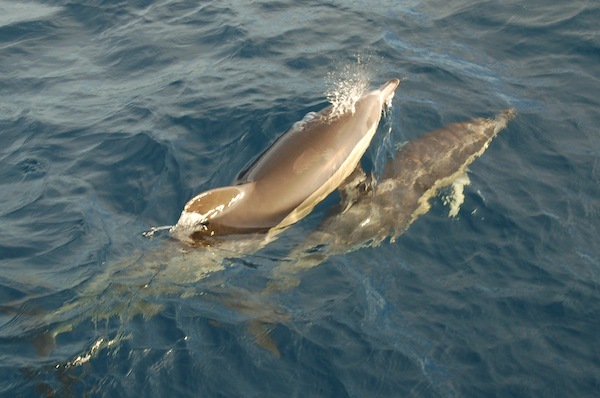 They were called common dolphins, and they were even more wonderful than I had imagined. They looked like huge, bright, shiny, newly painted toys! Their sides were yellow, and they glistened. We had other visits during that journey, but none of them stayed long because they were fishing. Dolphins chase and eat fish. They are at the head of their food chain, rather like man is on land. 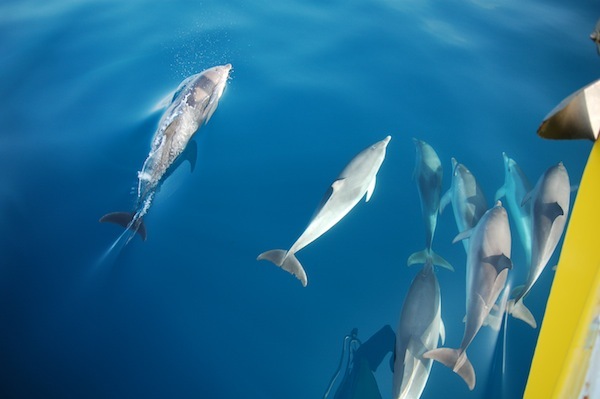 We actually see dolphins quite often in the ocean – probably almost every other day – and they sometimes come to surf at the bow and race each other to and fro under the boat. They seem to just do this for fun. In the dark they swim beside the boat, instead of at the bow, leaving long streaks of phosphorescence. Once, we were becalmed a little way off the island of Tenerife. There was absolutely no wind and we had been sitting there for more than a day. We had to be in Santa Cruz by four o’clock, or we would miss the carnival, so we had to motor. Mollymawk sliced through the perfectly flat, mirror like sea, and then suddenly a school of dolphins came to see us. They stayed at the bow for about half an hour, and because it was very clear and calm we got a very good look at them and Mummy took lots of very good photos. They definitely liked the fact that the boat was moving fast. They had a lovely game at the bow, and every now and then they would roll over and look up at us. 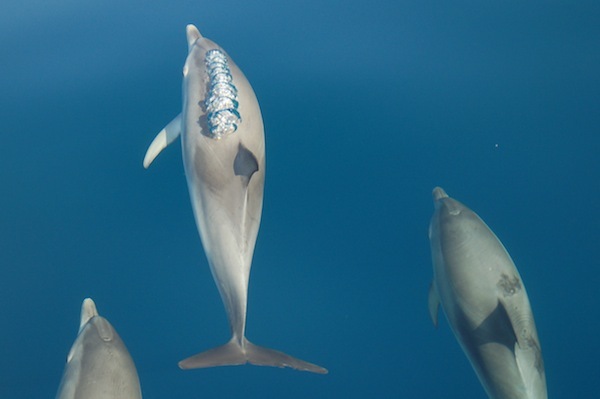 One place where you can be almost certain to see dolphins and pilot whales is at the eastern end of the channel between Tenerife and La Gomera. Often it is very windy here, and our friends aboard Tosca, who have crossed ten times say that they have never had less than a gale, but whenever we cross it always seems to be flat calm. This is perfect conditions for seeing dolphins and whales – but unless you are motoring it is not perfect for having them come to the boat. 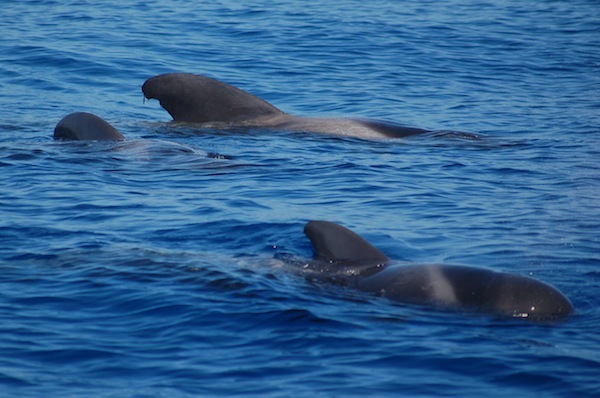 Having had the pilot whales pass very near to us on one occasion we decided that if it was calm next time we crossed we would like to go overboard amd swim with them. Swimming with the dolphins is not a new idea of course. 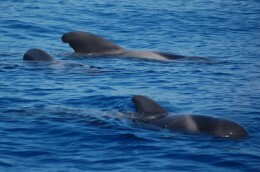 Our friend Gigi swam with the pilot whales when he sailed across between the two islands. His brother-in-law made a video with his underwater camera. And some other friends have swum with the dolphins in the Caribbean. They had to keep getting into their dinghy and motoring after the dolphins, because the dolphins didn’t stop to play with them. We were a bit nervous about swimming with the pilot whales, because they are very big. When we saw them coming towards our boat we got ready – but the whale was swimming very fast and before anyone had jumped in he had passed us. Then Daddy said, “There are dolphins too, coming from the other way.” Mummy hurried into the water and Xoë and I followed. We swam to the bow, and as we reached it a group of four spotted dolphins crossed the bow. When they saw us they stopped and turned their heads to look. The water was full of their squeaks and also a sort of buzzing noise. They were chubbier than I had expected. 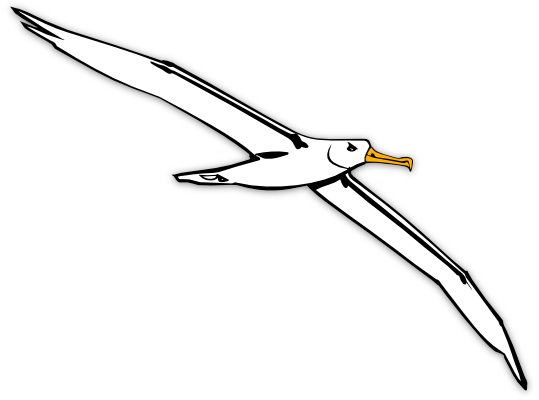 When you see them from above they look very long and thin. The water was absolutely perfectly clear, and a beautiful blue. 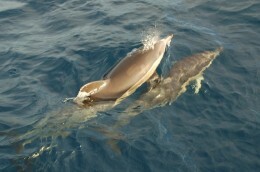 The dolphins were about four metres away, but when we tried to swim nearer they moved away and then looked back again. They were not scared, just careful. Mummy was making weird noises in her snorkel and I think that made them curious, or perhaps they would have been curious anyway. They can’t have seen people very often, if ever, so it’s funny they didn’t stay for longer to investigate. Swimming with dolphins does not always go so smoothly. 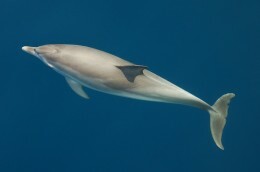 Another friend, called Christoph, once swam with a school of dolphins in the Bahamas. While he was trying to keep up with them they disappeared, and he suddenly found that he was swimming with a shark instead! It was bigger than him, and it came in close enough for him to try to kick it away. Then it circled him twice. It is said that a shark circles three times before attacking, so Christoph was rather alarmed. He called out to his friend, who was still on the boat, and his friend started the engine. That scared the shark and he swam away, and Christoph lived to tell the tale.